would prove — or at least suggest — otherwise is evidence that these attacks are swinging voters toward the Democrats. But if anything, the opposite is happening. I agree, but I’d offer up two responses. First, it’s too early. The anti-Chamber campaign has only been active for a few days. That’s far too short a time to see any effect even if it’s a good electoral strategy. Second, I think of this in much longer terms. It might or might not help in the November midterms, but Democrats really need to let the public know that the Chamber should be thought of the same way as the NRA: an extremely aggressive special interest group with huge amounts of cash and a hyper-partisan outlook. Getting that message out successfully doesn’t mean the Chamber would be defanged. The NRA, after all, is still famously powerful. 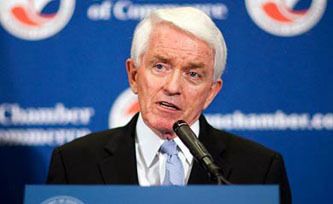 But it does mean that it might lose some of its influence among centrist leaners, who still think of the Chamber as a vaguely reliable souce of civic worthiness and don’t realize what Tom Donohue has turned it into. That’s useful stuff for future elections whether or not it does any good this year.